Tai Chi is becoming very popular around the world for health improvement, and for good reasons. Scientific studies show that tai chi improves and possibly prevents chronic conditions such as arthritis, heart disease and diabetes. In addition, it improves balance, immunity and reduces stress. In fact, tai chi improves practically any aspect of health. There are many forms of tai chi but specially designed programs for health have many advantages. 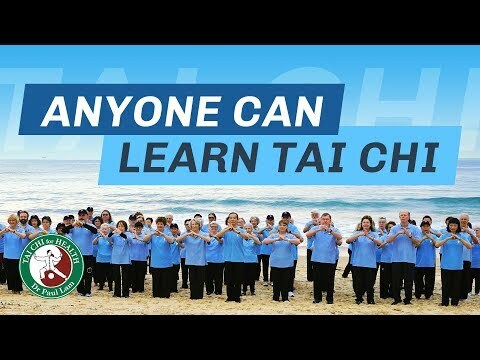 Since 1997, Dr Paul Lam has worked with tai chi and medical experts to create a series of Tai Chi for Health programs that are easy and enjoyable to learn and, at the same time, deliver significant health benefits. A number of published studies have shown these programs are safe and effective. Created by Dr Paul Lam and his medical and tai chi colleagues to make your tai chi journey more rewarding! Hour for hour, practising a Tai Chi for Health program is probably the most effective exercise to improve health and wellbeing. You can start and continue to progress to higher levels no matter your age or physical condition. More importantly, tai chi helps you to know and like yourself better. This will lead you to health and harmony within yourself and with others. It is so enjoyable that millions of people around the world are practicing it. What Tai Chi Can Do for You?